This month we are focusing on our bodies. At Time Out Beauty, our main focus is the skin, however, we have to bear in mind that some skin conditions are caused by gut issues, poor diet, lack of sleep, medication etc. It can be frustrating that in some cases even though the client’s skin care regime is good, certain skin conditions fail to be resolved. So if we acknowledge the body holistically it could be due to other issues deeper than the skin. After meeting with Chiza Westcarr, the educator for the Miss Vitality Nutrition range, we were blown away to discover that this therapeutic range is designed to correct skin health from the inside. We were confidently told that these scientifically developed products guarantee results due to their therapeutic dose when taken as directed. These TGA approved complementary medicines are in fact active enough to bring about change in the skin and body. We were also impressed that this range is not only Australian owned, but also uses certified organic ingredients. "This range stands out as it is more potent due to its therapeutic dose." Chiza is also a strong believer that most conditions begin in the gut, and these products promote gut health. 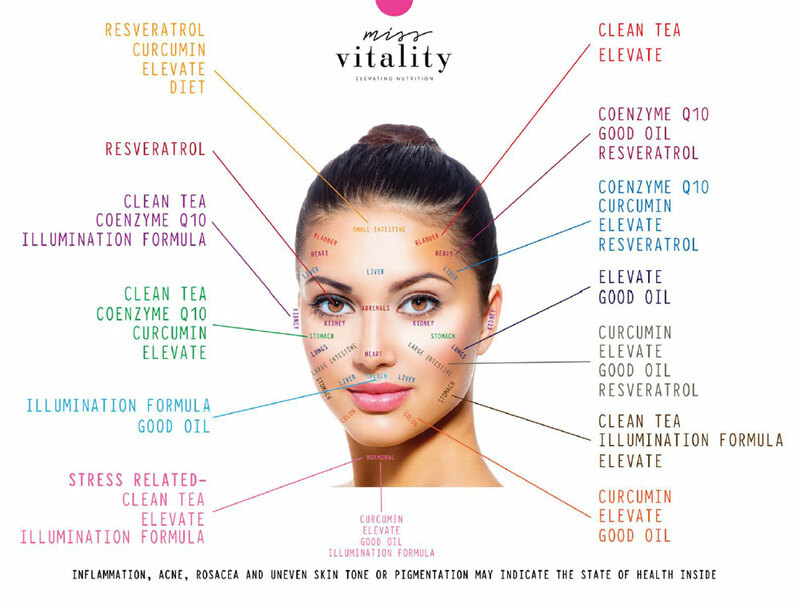 Miss Vitality Co-Founders, Naturopath Pamella Zakostelsky, and Paramedical Aesthetician Natasha McCrystal have over 35 years combined experience in the health and skincare industry. They have combined their extensive knowledge and skills to formulate this effective range. With their findings Miss Vitality was born; a wellness movement that represents nourishment on a cellular level protecting our cells from the damages we face within our environment, the food we eat and stress levels from everyday demands. “Age Prevention is now here on a nutritional and cellular level… what we do today is the future of our health, the prevention of disease and protection of the cells”. Inflammation is a major contributor to ageing. The Miss Vitality range uses anti-inflammatories throughout their range. Certain products in the range also assist in reducing the toxic load. As a skin therapist, I am now inspired to obtain even better results for my clients who suffer from conditions such as rosacea, acne, pigmentation, dull and devitalised skin, itchiness, sensitivity, and ageing. We should all take time out for a cup of tea, not only to unwind but to detoxify and protect our body and skin. Clean Tea is a therapeutic herbal infusion that is suitable for everybody* (*not recommended during pregnancy). It contains certified organic ingredients and is caffeine and sugar-free. This blend of detoxifying plants will purify the body and enliven the skin. It is rich in antioxidants which not only strengthens immunity but cleanses the gut and aids digestion. Delicious to enjoy all year round as a hot soothing tea in winter and a cold refreshing iced tea in summer. 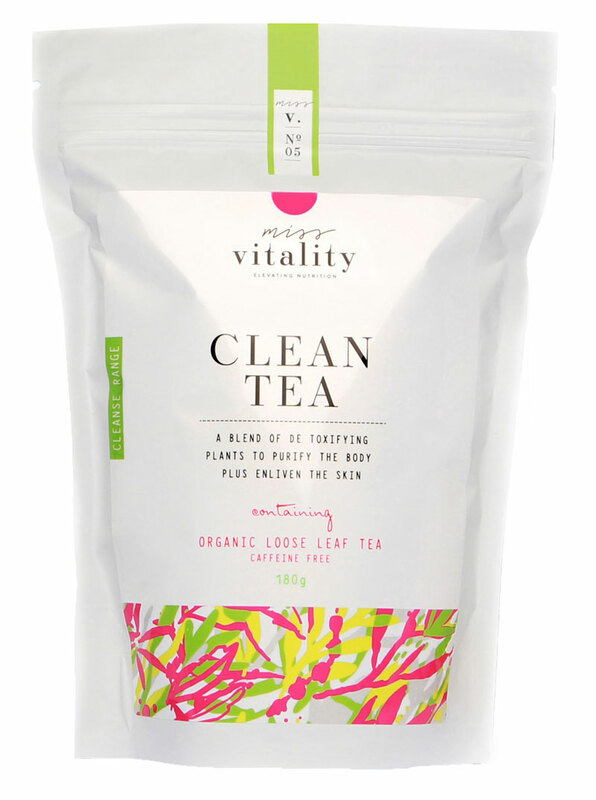 Make Miss Vitality Clean Tea your special time out ritual to promote healthy eating and lifestyle habits. Look out for Part II when we discuss more products in the Miss Vitality range. Time Out Beauty is a specialist cosmeceutical and botanical skincare online store. We stock a wide range of products with free delivery available. We have a Reward Money loyalty program for return buyers. Our brands include Medik8, Synergie Minerals, Waterlily, Societe, Skin Medica, LashesMD, Aspect, Teen Aspect, Colorescience and Cosmedix.